I'm house sitting for awhile and altho I have a "pool guy" I still have to stay on top of what's up. We've got the cleanup an PH under control but this pump seems to lose prime every day. I have to pour about 4 pitchers of water in it before it gets going. I did grease the O-ring on the pump basket for a better seal. Reading about air in the system an "air relief valve" is mentioned but I don't find one. I'm thinking of taking it off automatic for fear of ruining the pump and only running it when I'm here. It's either that or drain the pool so it's no longer my responsibility. It's an above ground pump and 'pool guy' says better if it's at pool water level .... but many pumps around here are above ground. Another possibly related issue is the pool looses about 2" of water each day. 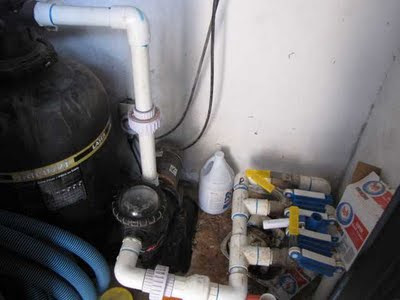 I'm going to turn off the pump and filter tomorrow and see if it's loosing water just sitting or is it only during circulation. Not quite sure why cleaning this pool and keeping it in balance has become such a project, but it has. 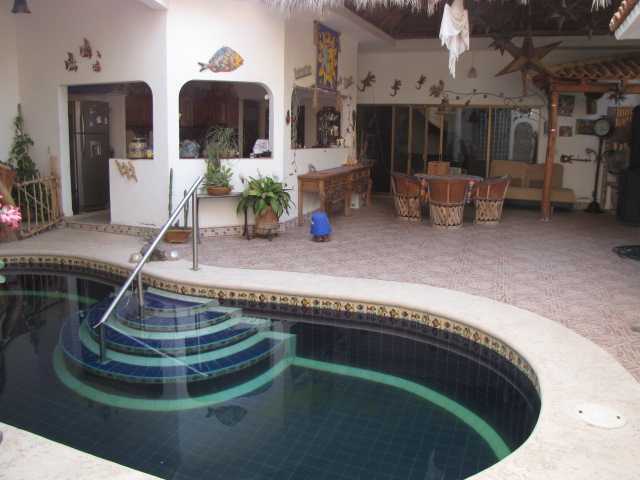 I've only been house sitting this house for a week but I didn't think pool maintenance is that complicated. The pool immediately went green and we found there was ZERO chlorine in the water. We added the "floater" with chlorine tablets, vacuumed a few times and now added a "shocker" to make all the "green stuff" go to the bottom to be vacuumed. Then there's the pump, filter and maze of valves that needs to be understood to filter, back flush the filter and find a balance for the normal circulation timer. When exercise time comes, or lets doing something together time, we usually head out the back road into the farmland. 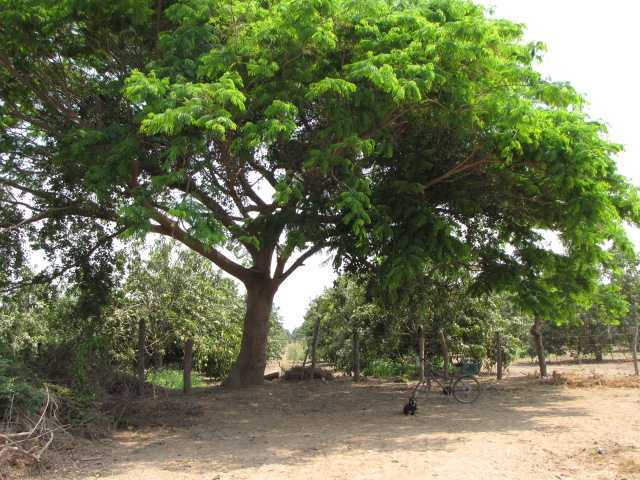 Our primary destination is usually a shade tree to cool off before the return. To the west of the road are mango orchards, some old with huge trees and younger orchards where you can pick most of the fruit from the ground. So mango season is here and the local markets will soon be flooded. Yesterday was a "lets doing something together time" for the dog and I and it was not that positive. We took a ride (in car) up to the local dam at the base of the mountains. Found out she does get car sick, maybe too soon after eating. 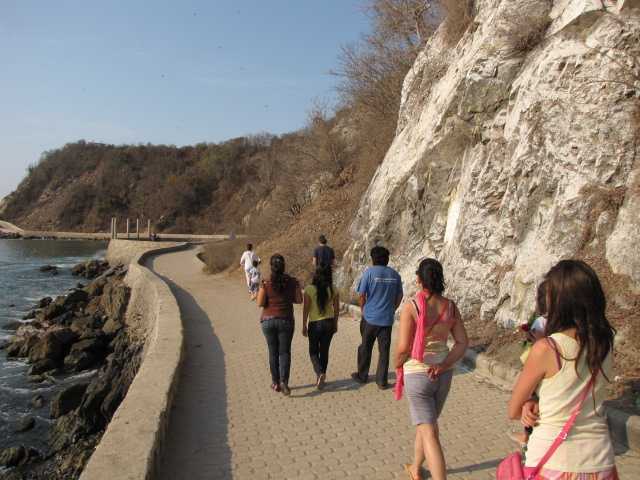 After that we tried Cuatecomate beach but too many people and too small a beach. The west end of Melaque was better but Coyota is afraid of the ocean and terrorizes the beach with her energy. Hopefully she will calm down when she gets a little older. 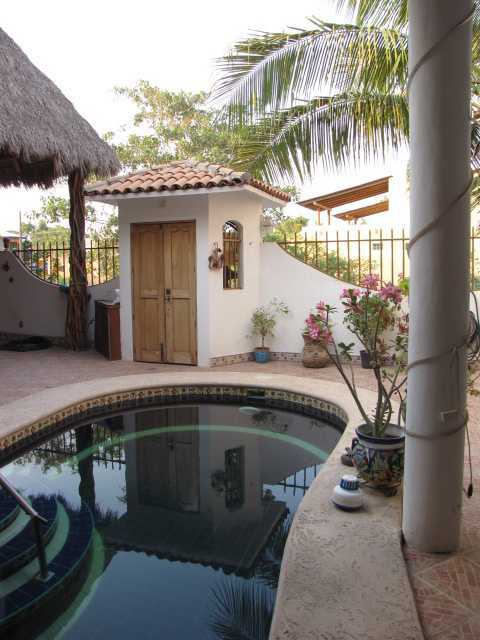 This weekend I will have 3 houses, Shoe's until Monday, the one I'll be house sitting starting Saturday and mine in Pinal Villa for quite awhile longer. Tomorrow I head to Manzanillo to turn off the service here at Shoe's and also try to get on a list of phone/Internet service in Pinal Villa. The phone here is not in my name and I could just walk away like many do if they are leaving the country or service is not in their name. I assume there will only be bills for a call or two from last month, I don't want service next month so next to nothing should be owed. 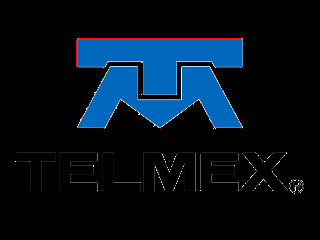 Hopefully Telmex just wants their ancient modem back ... and if not I'll just shrug my shoulders and say, "It's not me". The other issue is phone service in Pinal Villa, of which there is none. Supposedly they need a list of 100 residents wanting service before they will wire the community. If there is a list I will get on it. 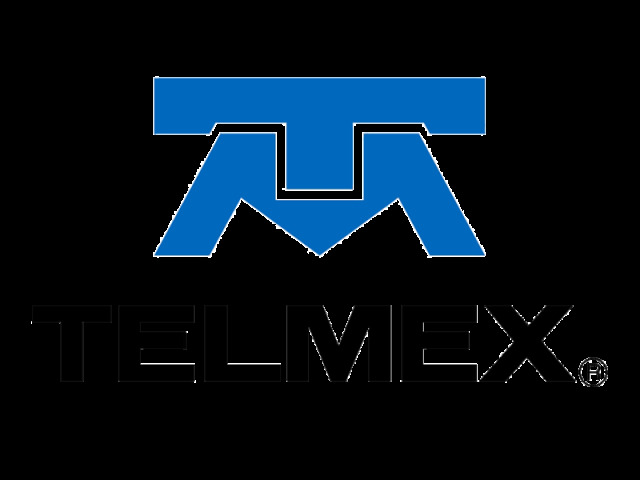 If not then I've heard some positive stories about Telcel (wireless) reception in this area from others in my situation. 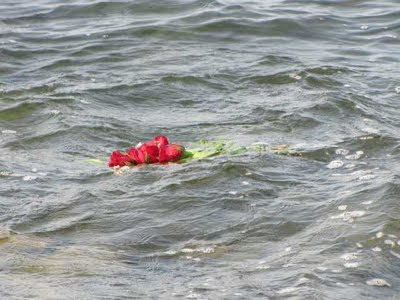 Shoe told Silvia to spread his ashes where he could watch people, at least that was her interpretation. Last week the family was here for this occasion and Pepe and family came along. 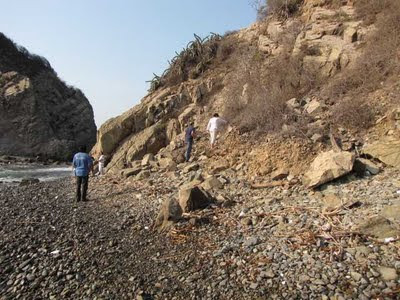 A tearful Silvia lead us out the malecon and beyond to the rocks at the end of the bay as she sprinkled Shoe's ashes all along. 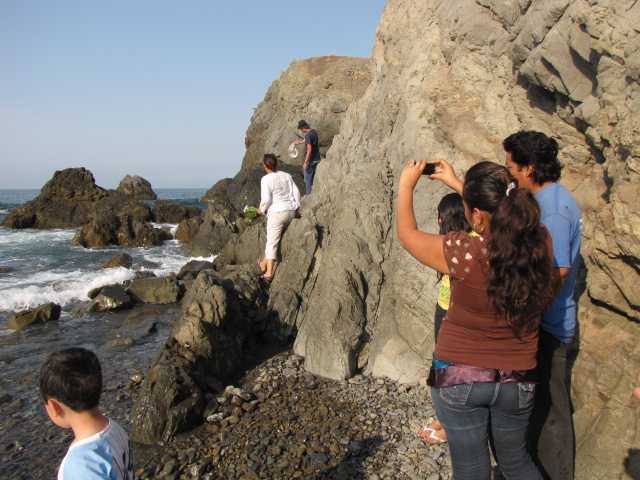 Manuel, Silvia's son, took the last bit of ashes out on the rocks to let the larger part of the Pacific Ocean have them. The throwing of the wreath was the end of another short story of life here on earth about one of us. Which way home, de la directora Rebecca Camissa, es un documental que narra la historia en tiempo real de varios niños centroamericanos y mexicanos que viajan rumbo al norte en el techo de los trenes, en busca del sueño americano. Varios de ellos desaparecen en el trayecto, algunos son regresados a sus países, y solo uno llega a los Estados Unidos para ser deportado después. Filmado bajo auspicios de HBO ahora Which way home ha sido nominado a los Oscares, y la importancia de esto es, más allá de que lo gane o no, el llevar la historia de los inmigrantes niños que cruzan territorio nacional enfrentando toda clase de peligros en la ignorancia total del mundo. 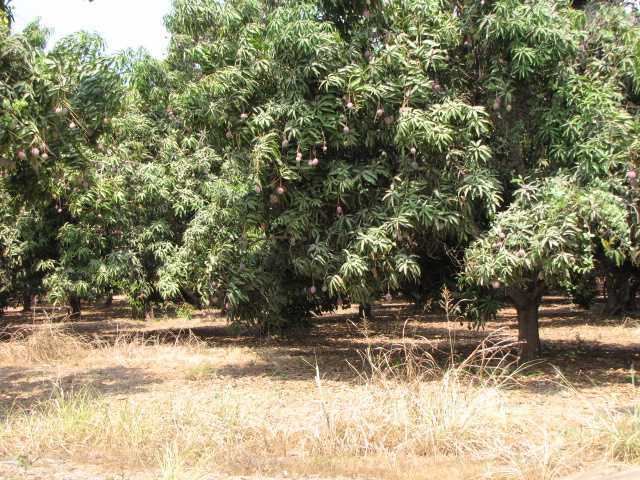 I live in the middle of an old Mango orchard in Pinal Villa just outside of Melaque. Even though most of the trees have been cut down to make way for people and houses ... the lot next door has two very old trees. 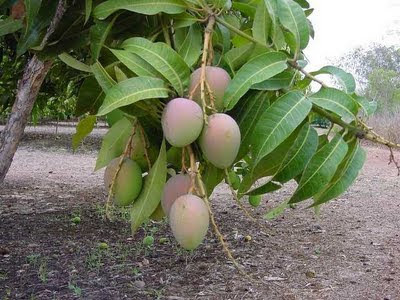 Neigbors were able to get 5-6 Mangos that are showing a good amount of color yesterday. Usually with a long stick and a small net on the end but yesterday just a stick. 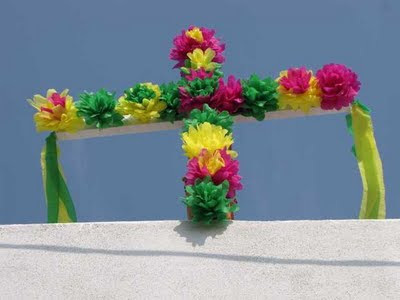 This is the cross Hugo's wife made for the Dia de los Albañiles and it's proudly tied to the top of my front wall. She's an artist of crape paper and this is probably not her first.